In the city of Mérida, the world's longest, highest, and coolest-sounding gondola climbs the Andes to 13,270ft over almost eight miles. It's a highlight of Venezuela, and when I arrived it was completely closed, indefinitely. Damn. I knew it would be a touchy subject at the tourist office, and when I inquired about when it would be fixed and reopened, the representative almost banged his head bloody against the desk. Politics, pure politics, he said sotto voce. All the decision makers are in Caracas and we can't get an answer out of them. With time ticking away before I had to move on, I taxied to the botanical garden. On weekends, they open a naturalist boot camp where you can frolic on an aerial playground in the upper canopy of tall trees. At least I'd be able to get off the ground somehow. Bound and belayed in a climbing harness, the first challenge is to scale the round bamboo steps of a loose rope ladder dangling 40ft feet from a tree. Big feet are not helpful here. Once you reach a platform in high tree trunk, the next trial is to cross the planks of a slack and teetering rope bridge, positioning yourself exactly in the middle of each step so the whole structure doesn't skew away. At the end, you scramble like a spider to ascend a duct-taped (gulp!) 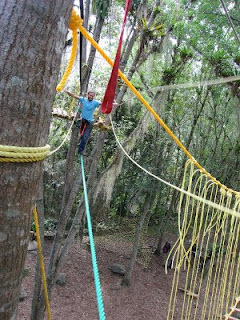 net and then clamp in and do a Tarzan yell as a zip line ferries you to the next tree. I was doing fine until I saw the next stage, a stroll across a barely taut rope, with only limp parallel lines for balance. Although I would be tied in, my knees began to quiver. My brain flashed to the movie Man on Wire about a fanatical acrobat who snuck in and rigged a line across the Twin Towers and then tightrope walked between them. But thinking too much can be toxic. Egged on by a cloud of mosquitoes salivating around my arms, I put my trust in the equipment and tiptoed across. Flying down a final zip line to the ground, I successfully avoided the bulls-eye tree at the end and reunited with terra firma. I love Mérida.